The Trump administration’s National Security Strategy (NSS) has pledged to further isolate rogue left-wing dictatorships in both Venezuela and Cuba and blamed powers such as China and Russia for helping them survive. The document, published on Monday, calls out both Russia and China for their providing of financial assistance to both regimes. “Both China and Russia support the dictatorship in Venezuela and are seeking to expand military linkages and arms sales across the region,” it continues. “The hemisphere’s democratic states have a shared interest in confronting threats to their sovereignty. In October, Russia offered a $3 billion debt restructuring package to Venezuela on its debt, while China has also shown patience with Nicolás Maduro’s socialist regime, which has defaulted on a number of its debts totaling a hefty $190 billion. Cuba has also been the beneficiary of strong trading and financial relationships with both countries. 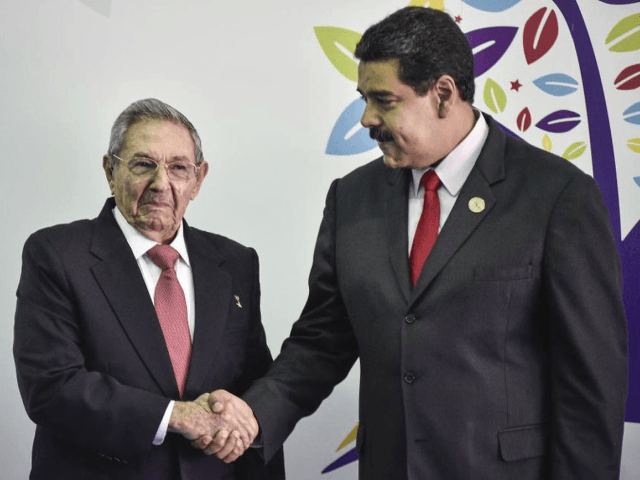 China recently became its communist ally’s largest trading partner with Russia now sending oil shipments to Cuba as Venezuela fails to meet its needs. However, frustrations have boiled over in recent months after one of China’s largest state-owned companies filed a lawsuit against the Venezuelan state-run oil firm Petroleum of Venezuela (PDSVA) over their failure to pay their debt, while the government has also begun cutting off key exports to Cuba over lack a lack of payment. President Donald Trump has repeatedly sought to increase pressure on both Cuba and Venezuela by taking steps to roll back the Obama administration’s “normalization” process with Cuba and reintroducing sanctions on the Castro regime. As Venezuela slips further into a dictatorship, Trump has also imposed a range of economic sanctions against the country’s state-run oil company, as well as personal sanctions against Nicolás Maduro and other high-level government officials. He has warned that the U.S. will “not stand by as Venezuela crumbles” and even floated the possibility of a military solution.